Today Judi is a leader at Nazorean House, where she loves cooking, ironing, and doing housework. Judi is an adventurous traveler. She loves nothing more than butterflies or cows, and will travel any distance to see them. Judi is a true friend. Recently, when Judi heard that there had been a fire in Beverly, hometown of our development director, Pam McGrath, she told Pam, “You do know that I will take care of you if anything happens. Judi grew up in Salem, Massachusetts, across the bridge from Beverly and forty minutes from her home today in Haverhill. She was the only child of Stephen Roger Longval and Lucienne “Luci” Ellen Boulay. That made her a grandchild of French Canada, like many in New England in the mid-twentieth century. Her parents spoke French in the house. Judi speaks proudly of her father, who worked at Bernard’s Jewelers in Salem, where he was a watch repairman and engraved trophies. Home movies from the 1950s show her father doting on his smiling, vivacious daughter. Dad died relatively young, and until her mother’s death about six years ago, Judi and her mom were devoted to each other. Mary Lou Furey has known Judi since Judi was two. Judi’s mom was a friend of Mary Lou’s mother, and Mary Lou, as a teenager, was asked to babysit Judi. 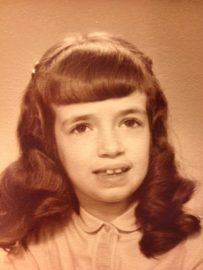 Judi attended the Devereux School in Marblehead, which had a small special-needs program before many other school systems, including Salem. On weekends, Mary Lou recalls, “her mother and father went out, and I took care of her. Also when they went on vacation. I feel like a caretaker still.” Today, Mary Lou and Judi still meet often for lunch, sometimes with Pam McGrath and Judi’s Aunt Dolores. 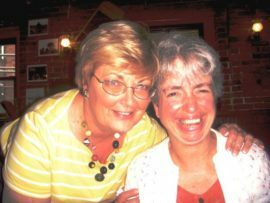 Mary Lou was instrumental in introducing Judi to L’Arche. Judi moved into the old L’Arche Irenicon house in Ipswich in 1992, about a year before community moved to Haverhill. Recalls Mary Lou, “When her mother and I took her down there the first day, honest to God, she was so happy. She went right to the bedroom and was so happy, dancing and singing, that she didn’t even say good-bye to us. Her mother and I were both crying, we were so happy. 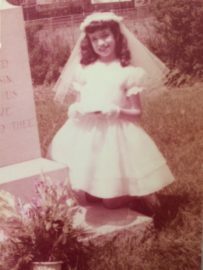 Today, Judi is a regular communicant at Sacred Heart Church in the Bradford section of Haverhill. She walks there alone from her home at Nazorean House. 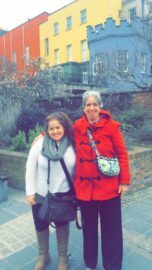 Judi is a proud ambassador of L’Arche on her solo walks into town, where many know and love her, including the folks at Oh! Daddy’s in Bradford and those at the YMCA, where she swims every Tuesday. Judi works Tuesday afternoons at the L’Arche Boston North office, where Pam describes her as “a great welcomer.” On Wednesdays and alternate Fridays Judi works upstairs in the office of the Arc of Greater Haverhill-Newburyport. Pam marvels at Judi’s taking up step dancing at age sixty-five. “That not something I’m going to do—but I love cheering her on,” Pam says. At L’Arche Boston North, we do love Judi, and the feeling is mutual. She is a shining example of a life fully lived, with joy and caring in community. Before this article was posted, Ariana sat down with Judi to review it together. After one reading, Judi asked to hear it again. After the second reading, Ariana asked her what she thought of it. Judi said she loved it.